You wouldn't expect to have a new album released by a 90 year-old middle-of-the-road musician who had his biggest hit singles over 50 years ago with his then-wife Mary Ford on such safe fifties favorites as "Tennessee Waltz," "How High the Moon" and "Vaya Con Dios." You certainly wouldn't figure on that artist getting a series of admirers like Eric Clapton, Sting, Joss Stone, Richie Sambora, Keith Richards, Steve Miller, Johnny Reznick, Joe Perry, Mick Hucknall and many others to contribute to that new project. 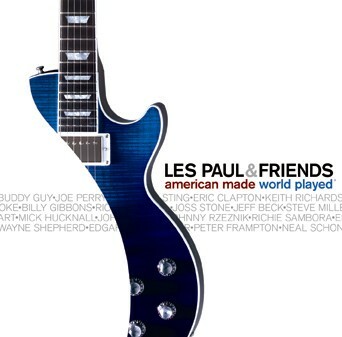 However, Les Paul isn't just another fifties musician. Beyond being widely respected as a fluid and intuitive guitar player, he is also an innovator and the inventor of the building block of modern rock and roll music; the electric guitar. Because he is responsible for their livelihood and their love, some of the greatest guitarists in modern music help Paul record some classic (and not-so-classic) songs. This album is essential if for no other reason to have Paul and Keith Richards (and Rick Derringer) backing bluesman Buddy Guy on a storming version of "Good Morning Little Schoolgirl." Billy Gibbons' of ZZ Top throws down a wonderful boogie version of Robert Palmer's "Bad Case of Loving You." Also shockingly bluesy is a version of "I Wanna Know You" anchored by a strong guitar jam by Paul and Journey lead guitarist Neil Schon as well as a spectacularly bluesy vocal performance by Beth Hart, whose own minor hit "L.A. Song" a few years ago only hinted at the Joplin-esque power of her vocals. A cover of U2's "All I Want Is You" by Paul and Goo Goo Dolls leader Johnny Rzeznik also works surprisingly well. Some of the song choices are a little suspect. For example, if you have to find a Bonnie Raitt song to cover, would you really start with minor 1994 hit "Love Sneaking Up On You." Now, granted, in the hands of Paul, Joss Stone and Sting, the song rocks out, but still it's a kind of odd choice. Also, couldn't they have found a better song to mix guitar legends Paul, Edgar Winter and Kenny Wayne Shepherd than the 1974 hit "Rock & Roll Hoochie Koo." Having Steve Miller redo his classic "Fly Like An Eagle" is also a double-edged sword, it's a classic song and Miller sounds great; comfortable with a song which he has performed thousands of times at this point. However, it isn't really as good as the original recording. Two of the best moments here are when Paul takes vocals by the late, great soul legend Sam Cooke and updates two of Cooke's classics, bringing in guitarist gods Eric Clapton (on "Somebody Ease My Troublin' Mind") and Jeff Beck (on "Good News") to garnish what were already pretty spectacular songs. More unsettling is a revamp of Paul and Ford's 1951 chart-topper "How High the Moon," in which Ford's vocals feel a little out of place in a noodling modern guitar template.